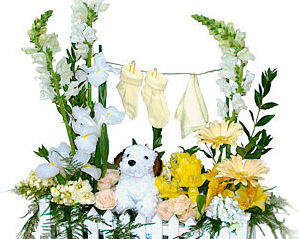 Welcome home that bundle of joy and congratulate the parents. We have practical items like receiving blankets and outfits, food for starving and tired parents, and fun things, because baby items are just so cute. 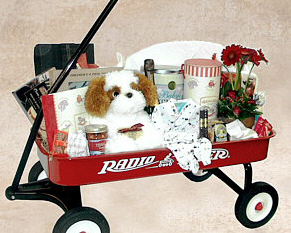 We can create a baby gift basket, put it in a reusable box, or design it in our popular red wagon. 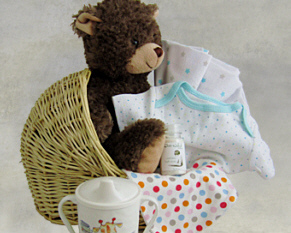 Most of our baby items are organic, fluffy, and adorable. 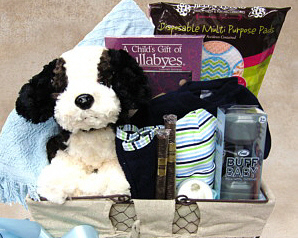 "I just wanted to let you know I've ordered your Baby Treasures Gift Baskets twice in the last couple of months for 2 of my nephews new babies. 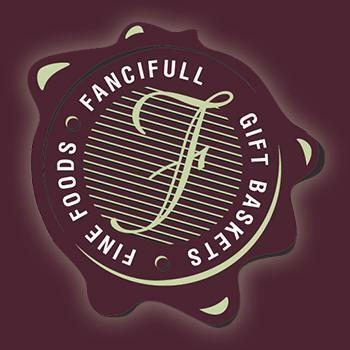 They loved them and said they were the most beautiful & best gift baskets they're ever received. I'll definitely be ordering another one in a month or so for yet another nephew who is due to have a baby. 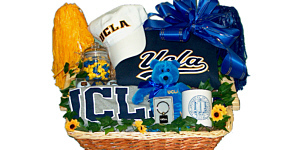 I know the basket will be wonderful. 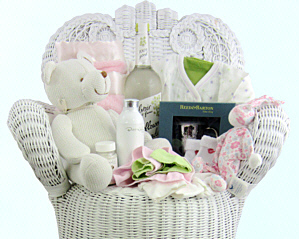 Thank you very much for the beautiful baby gift baskets - they're great & you're doing a great service. " 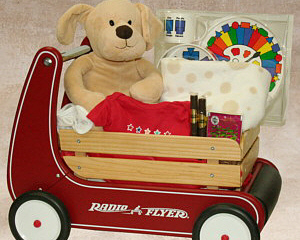 - Christine C.
Featuring organic products seems to us especially important when selling items that will go on a newborn. 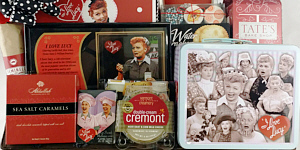 We are particularly enamored with MilkBarn a mother-daughter collaboration. 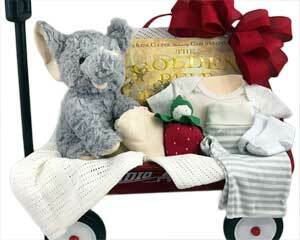 That seems appropriate for baskets going to moms and babies. 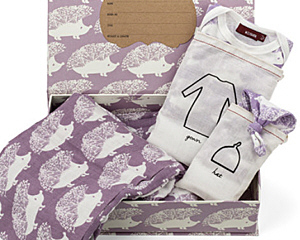 Stacy, the founder, had her college aged daugher create designs which may be why they are so fresh and whimisical: purple swaddlers with hedgehogs and cardigans with blue whales. 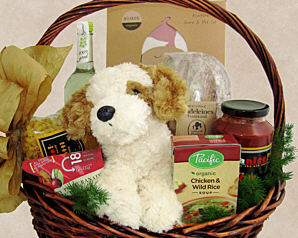 Their products are high quality, well designed and packaged beautifully. 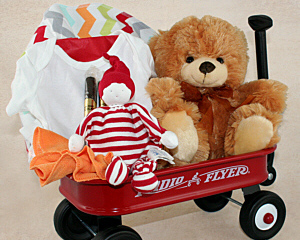 It may be why their clothes are so popular with customers in the shop and will stand out in any gift going to a new mom. Yesterday we put a personalized license plate on this sporty pink peddle car to bid welcome to a newborn girl whose name is Sage. I can just imagine her in a couple of years riding around her house in her own car with her name on it.